The oceans play a fundamental role in global climate evolution. Over the course of a year the oceans absorb heat and transport freshwater, cycling energy and transporting water in a circulation that mirrors atmospheric flows. Covering 71% of the global surface by area, and containing 97% of global water by storage, this large reservoir plays a critical role in determining our future climate. Changes to the ocean have been observed over the 20th and early 21st century. These changes suggest that 90% of the increased heat due to anthropogenic climate change is now found in the ocean (Church et al., 2011). Alongside this observed warming, both in the atmosphere and the ocean, changes to the global water cycle have been recorded. These changes are expressed in the ocean salinity field, which acts to integrate long-term, broad-scale changes of rainfall and evaporation at the ocean surface. Over time, these changes in the surface freshwater forcing propagate into the ocean interior, changing the properties of ocean waters even at great depths. 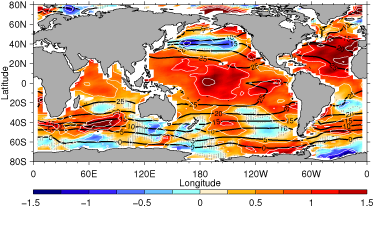 Salinity changes in the ocean confirm the climate and the global water cycle have changed (Durack et al., 2012). CSIRO has recently published new estimates of changes to ocean properties. The tab above: Data Downloads provides links from which to obtain copies of data and figures. CSIRO is active in ongoing global ocean monitoring programs. The tabs above: Sea-level rise and Argo: real-time provide more information about each of these ongoing projects. Absolute surface temperature change over the period 1960-2008. 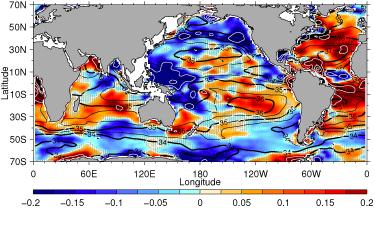 The ocean is warming over most of the globe (red). Absolute surface salinity change over the period 1950-2000. Rainfall and evaporation changes are making the oceans less salty in vast regions (blue) and more salty elsewhere (red).